This is one of the weirdest ideas/experiments I've seen yet. A. Smith Bowman Distillery in Fredericksburg, VA has been releasing limited releases, and last year they released a "Gingerbread Cocoa Finished Bourbon." I had never seen one on the shelf until recently, so I never had reason to question it as anything other than being kind of an odd finish. When I did finally come across one, my curiosity got the best of me, and I just had to wonder, what exactly does it mean to be "gingerbread cocoa finished"? It's not exactly like port finished bourbons, where the product typically requires use of a barrel, thus allowing for the finishing of the bourbon in said barrel. I haven't exactly seen barrels of cocoa or gingerbread, and I'm pretty certain that's not a thing. So what is this whiskey exactly? What isn't immediately apparent from the label is that this whiskey was, in fact, finished in barrels. These barrels originated in the A. Smith Bowman distillery and originally held bourbon. After they were emptied, Hardywood Park Brewery in Virginia got their hands on the barrels and used them to age two types of beer: their Gingerbread Stout and their Foolery Imperial Milk Stout (both of which sound delicious!). Hence the gingerbread and cocoa. 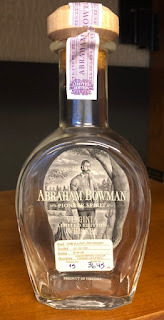 After the barrels were done being used for aging the beer, they made their way back to A. Smith Bowman, where they were used to then finish this particular limited release whiskey. So, with all that out of the way, how does it taste? Before we get to that, the gingerbread is very noticeable on the nose. I also got some corn as well as a light cinnamon. Beyond that, it didn't give of much that made it seem too far afield from traditional bourbon. I did kind of expect a boozy, beery smell that simply wasn't there. And it didn't have any boozy, beer flavor either. Rather, the palate was loaded with unsweetened cocoa. It did not have the chocolate notes that I kind of expected, but rather the baking cocoa flavor. Interestingly, I did not get the gingerbread on the palate that I got on the nose, which was a bit surprising. Beyond the influence of the finish, it comes across as a higher rye bourbon, somewhat spicy on the back end yet with a decent vanilla finish. However, it just did not have any sort of "pop" to it. It has an almost creamy texture to it, which seemed to almost mute the flavor. While the cocoa and vanilla and cinnamon notes were there, they were soft and undefined. Interestingly, and perhaps this is where the beer influence came in, it had a weird finish that came through almost as an afterthought. It was as though when I stopped paying attention to the finish, an odd, sour/musty note came through that I couldn't really place but which certainly gave me pause. I wish I could describe it better, but it reminded me of when you get a sour piece of lettuce in your salad (real relatable, I know). This was a fun experiment, and I'm glad I got to try it. However, I don't see this as something I'd seek out again. I would like to give those barrel-aged beers a try, though!